Reoconstruction - Carpets/Flooring, Tiler - Tiling based in London, Greater London. 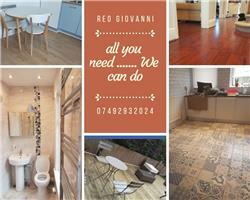 I'm Reo GIOVANNI from Reoconstruction London. I'm a builder from 25 years. The Reoconstruction London have experience to tiling and flooring wood . Please contact us for a free estimation.